Given the diabolical weather which covered most of Britain on Saturday - and the heavy rain that arrived on Monday - we can consider ourselves very fortunate to have had blue skies and only a moderate breeze for Letchworth Saracens first home games of the season. Being a two club cluster team, Letchworth Saracens have two home grounds but with the opposition coming from north of the two clubs (Ampthill and Bedford Blues), the honour of hosting this game fell to Letchworth. Doubtless this was also appreciated by the Norfolk Nomads girls who had quite a long enough journey as it was. With 5 clubs represented, we were able to hold games at close to full strength - 13 a side for the U15s and 15 a side for the U18s - which is quite a rarity these days and was very much appreciated. The U15s game was keenly contested throughout but Letchworth Saracens took an early lead and put on a good team performance to maintain the advantage throughout to end up winners by 42-10. The situation with the U18s match was very similar - a strongly contested game in which Letchworth Saracens took an early lead and continued to add to it throughout. However, this was no 'pushover' - the relatively young and inexperienced Bedford Blues/Ampthill team put up a strong defence and were still striving to stop the Letchworth Saracens attacks, and get themselves on the scoreboard, right to the final whistle. It was their misfortune that on Sunday, Letchworth Saracens managed to put on the kind of all round team performance that had eluded them earlier in the season and consequently ran in 9 tries to make the final score 55-0 to the home side. To: the ignorant, misogynstic dinosaurs responsible for the BBC Sports' rugby "coverage"
b) Llangennech vs Whitland in Welsh National League Div 1(West)? Well clearly the latter as BBC Sports' rugby news pages on the internet managed to ignore the former COMPLETELY. No preview, no report, no pictures - not even the match score on the results page. On the other hand Llangennech did rather better than that, with its fixture listed before the game and score appearing on the results page afterwards. I am sure that they are a popular local club but in what possible way were events at Llangennech RFC more newsworthy than a match involving the an international team that had won 23 consecutive internationals prior to the match (now 24) - comfortably a world record - playing against an England team unbeaten at home for 19 internationals? What on earth does women's rugby have to do before the blinkered dinosaurs responsible for the BBC's rugby coverage acknowledge that women play the game? That one player in 12 is now female? That the only England team capable of winning anything of any significance in the next x years is the women's team? And that the most exciting young player in the game is called Emily? You cover women's cricket, and women's football, and women's golf, and women's tennis but you IGNORE women's rugby (apart from the odd random six nations article). Why? Really, why? If you feel in a similar way about the BBC's failure to even mention that the Black Ferns are here, why not drop them a line too via the BBC Complaints Page. Remember to say "yes" to the question "do you want a reply". It seems a while since I have had a go at the RFUW in Twickenham, but a little information that reached me over the weekend needs passing on, I think. RFU figures indicate that there are at least 4,000 girls aged 13-18 playing rugby in England. I say "at least" because in fact this is almost certainly a wild underestimate - Sport England surveys would suggest that, as result of under-registration of girls and women (or the registration of girls as "boys" due to some of the features registration system) the figure could be easily doubled. Anyway - that's quite a few players for a minority sport. Significantly more than, for example, 60. Well I hear from a normally reliable source that RFUW are not willing to give their support to a proposed multi-club girls tournament (I will avoid saying which tournament to avoid any nonsense) because the date clashes with an elite girls' event. Or to put it another way the RFUW believe that a development day for a mere 60 or so elite girls - who are obviously starved for development opportunities, what with there being "only" 13 weeks of county and regional rugby, plus TDGs, Schools of Rugby, etc. etc. etc! - is more important than a competitive day's rugby for knocking on for ten times that many. It all confirms (yet again) that despite Twickenham's words about wanting to expand the game, their actions show that basically if you are not a potential England player they are not interested. On the positive front apparently the RFU have endorsed the tournament - so maybe things may change soon once the merger takes place. Thanks to Scrum Queens, highlights of the key moments from yesterday's first test are now available. Oddly the highlight package was produced by the RFU, but there is no sign of it yet on the RFU's website (well, not that anyone can find!). They have finally put up a match report, however. Our former coach, Simon, and his assistant, Kirsten, have just got married (today by the look of it) - more pictures of the day here. For those new to the club, Simon played prop for Letchworth 1st XV and became girls' team coach in September 2007 when Joe Randall (who now coaches Gloucestershire Girls') went off to university. He was responsible for introducing a whole vocabulary of new and colourful words and phrases and cajoled, drove, and encouraged the girls to what became (after a shaky start!) the U18s most successful season ever, with a top eight finish in the National 7s and a top five place at the National 10s. Unfortunately Simon and Kirsten had to return to their native New Zealand at the end of the season - but those who played under them or worked with them remember their contribution to the Legends with great affection. Good luck to both of them! England have been beaten by New Zealand in the First Test at Esher RFC today. The final score of 16-3 was significantly larger than most experts had predicted - especially given the conditions which might have been expected to favour England. Few details were available until nearly four hours after the game - indeed it is remarkable that information from home internationals still remains so hard to trace. We managed to publish live scores and even short reports from the touchline during Letchworth tour and tournament games as long as three years ago, and what with Twitter and Facebook anyone with a mobile phone can now do the same thing incredibly easily. Other unions have even experimented with live video feeds, but the RFU and RFUW remain... rather behind the times. However Scrum Queens had a correspondent at the game (otherwise it would all have still been a secret even now!) and have published a detailed match report. Surprises seem to be the dropping of Emily Scarratt to the bench (allegedly to "keep her fresh" - though as she is only 19 you'd think that a shade unnecessary!) and a truly awful kicking display - only one try in the game, it seems, but the Black Ferns slotted three penalties to England's one. "This game was a real fact finder for us ahead of the World Cup in 2010, and more immediately next Saturday. We are not a side that lose often, and despite that I am upbeat. We have found out today that they are not super human and we are certainly ready to fight again next Saturday. "I would have liked better playing conditions today. For 30 minutes of the game we were only 3-0 down, and if we had matched that I think it would have been a different story. Instead we made errors and they added a second penalty and a try just before half time. Then we were left chasing our tails." This Sundays friendly games against Ampthill/Bedford Blues have been moved to the Letchworth club which gives us our first home fixtures of the season and saves us all a bit of travelling! Will all players in both U15 and U18 squads please meet at the Letchworth club at noon on Sunday. There will be a warm-up/short training session leading to the matches kicking off at about 1pm. Why club rugby is so important. Teenage rugby sensation Emily Scarratt talks to Scrum Queens today in an interview that is part of the build up for the big game on Saturday. Emily - who appeared for Paviors against Letchworth on several occasions during her junior years - is still only 19. Since her full England debut earlier this year she has scored a remarkable 12 tries in 12 games. Emily is a great example of why club rugby is so important. If there had not been a small, local club to give her the chance to try the game she would never have taken it up. 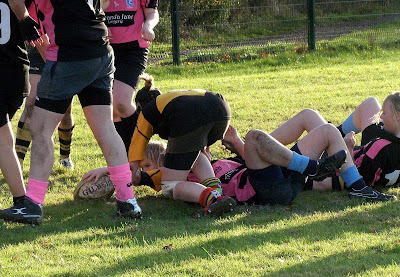 It does not matter how much money is poured into county teams or regional rugby, or how much effort is put into fiendishly clever and bewilderingly complex "player pathways", if it had not been for a few volunteers at Leicester Forest East RFC five years ago, one of the most exciting prospects in English rugby (male or female!) might never have picked up a ball! So its rather a pity to have to add that there isn't a Leicester Forest East team any more. I wonder how many Emilys the game has missed because their local club has folded? Four countries have bid to host the 2014 World Cup, the IRB have announced - the largest number ever, though as this is the first time the IRB have run a public competition to find a host for a Women's Rugby World Cup its is rather difficult to compare it with previous tournaments. In the past the IRB has tended to not even confirm that there would be a World Cup until the host was announced, normally only a year or so before the event. If bids were invited, the process was never a public one. But all that has changed, and four unions have stepped forward. As anticipated, no European nations are in the running - instead bids have been made from Asia (Kazakhstan), North America (USA), and Oceania (New Zealand and Samoa). However, in practice there would seem to be only one likely winner. While the sight of the New Zealand RFU taking the women's game seriously enough to host the World Cup is a good sign (and long overdue), the timing is rotten. They already have the men's World Cup in 2011 (a controversial decision), which is likely to count against them. It would also be the second successive women's tournament in a "major" rugby nation, and the IRB do like to use the women's and junior world cups as a means of spreading the game. Politically, the other three nations are likely to be more appealing to the IRB. Of these, Samoa face potential problems not only because of the size and geographic remoteness of the country, but also because as host they would have to take the place of a stronger nation (probably a European one) - which could cost them votes. Kazakhstan have a stronger case, but would have to make major improvements on their performance hosting the Asian championships last year (which sounds like it was something of an ordeal). All of which makes the USA overwhelming favourites. The only factor against them is that North America (in the shape of Canada) had the tournament in 2006 - but a minor barrier compared to those faced by their three opponents. The US have the facilities, the followers of the game needed to fill stadia, would qualify anyway (so would "deserve" their place in the tournament), and are not one of the eight "major" rugby nations. Tick, tick, tick, tick. The IRB will announce the winner in May. Since the announcement, the NZRFU seem to have recognised the potential problem their bid has and Radio New Zealand are suggesting that they might offer to share the event with Samoa. Unfortunately, for costs reasons, the IRB have always preferred to stage the tournament in a single city. Spreading it across half the Pacific is unlikely to be seen as workable (or affordable). The tournament to decide final qualifier for the World Cup kicks off tomorrow (at around breakfast our time). The Asian qualification tournament will be a straight knockout, with the semi-finals on Wednesday and the final on Friday. In practice the eventual winner is unlikely to be a serious contender next September, but it shoudl still be an interesting event. Hosts Singapore kick the tournament off against Japan at 8am our time (4pm local time) and deserve to do well, if only because of their astonishing enthusiasm and detailed preparations - none of the other sides have worked quite as hard as Singapore have, with three warm-up internationals in the past month. This is the first time they have entered the World Cup - Singapore did not even have a women's team in 2006. Japan, on the other hand, have been playing since the early days of women's rugby - but their preparations have been significantly less impressive and, while they start as favourites, there is a real chance of an upset - especially if Singapore can get an early score. The second semi final between Kazakhstan and Hong Kong kicks off at 10am. Kazakhstan are clear favourites for both this game, and the competition as a whole (they have never lost to another Asian team) - but they have played only four internationals since 2006 so who knows how prepared they will be? Weekend a long way off? Need a "fix" of rugby to see you through to the next training? Then why not try out these three new games - with the extra bonus of possibly winning tickets to England Men v Argentina on the 14th November. The games are part of an Investec site launched for the Autumn Internationals. There is a game that involves catching a scrum-half pass (but missing the flying boots - some game designer has a Wii methinks), the usual type of kicking game, and the promise of a tackling game to come soon. On the other hand the site has no mention of the women's internationals - even the Twickenham "double header". So once you've played the games, could I suggest that you go here and point out to them the error of their ways (I called them "misogynstic dinosaurs" - can you to do better?). That rare phenomenon in girls rugby- the morning kick off - happened on Sunday at Chesham where Bucks Jesters played Letchworth Saracens. Normally this would be much appreciated but, unfortunately, the weather forecast was quite accurate and we were treated to a warm-up and first half of the match in pouring rain which eased off in the second half. If only we had had the usual afternoon start, it would have been a very pleasant dry day! U18s captain, Claire, was poorly and unable to play so Bubbles stepped in to the scrumhalf role and Nikki took over the kicking duties for this match. With the wet and windy conditions and the slippery ball, this was not a good day for flowing backs moves and the match was largely a tough forwards battle. In the first half, Jesters had the better of things particularly in the rucks and they were rewarded with two excellent break away tries to reach the interval leading 10-0. With the wind and the slope in their favour in the second half, Letchworth Saracens raised their game and were in the ascendancy both in the forward battle and in territory throughout. However, they were unable to make that pressure count on the scoreboard. Scoring a third break away try midway through the half made the game safe for Jesters, but did nothing to dampen the attacking desire of Letchworth Saracens or the defensive determination of Bucks Jesters. Despite the heavy rain, both sides played the game with great spirit with every ball fiercely contested and it was a much more even contest than the 17-0 scoreline suggests. In the end, the difference between the sides was that Bucks Jesters took their chances and Letchworth Saracens did not manage to take theirs but that wasn't for lack of trying! All the girls should be proud of the way they stuck to the task and kept pressing right to the final whistle. The U15s league match could not be played as both teams were somewhat depleted this weekend. However, a 6 a side friendly game was played between the teams which everyone took to with great enthusiasm. With so much space around the field, this game was obviously one for the backs to enjoy (... and the forwards to endure!) and it did indeed turn out to be an end-to-end match. Despite a brace of tries from Sydney, and one each from Ellah and Vicky, the home side ran out comfortable winners by 42-20.